Tennis elbow is a painful condition caused by repetitive stress to the tendons and muscles near the elbow joint. 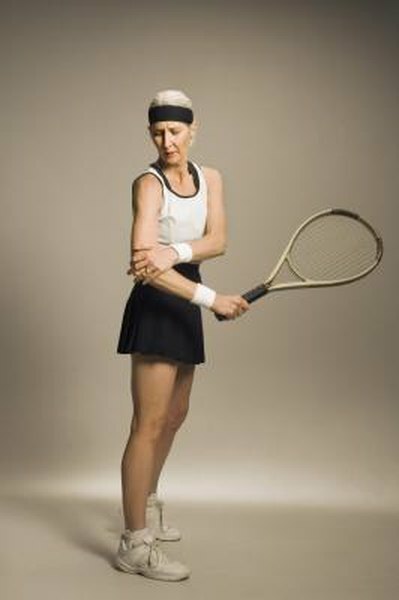 Tennis elbow can make it difficult to participate in certain sports and activities or to perform common tasks around the house. Some physical therapy exercises you can do from home could remedy your tennis elbow and get you back to doing the things you love. See a doctor if your condition doesn't improve. Because the wrist controls much of the action in your forearm, it can be directly related to tennis elbow, so stretching and strengthening exercises for the wrist can help relieve the symptoms of tennis elbow. To stretch your wrist and the tendons and muscles in your forearm extend your arm out in front of you and lock your elbow. Grab the hand of your extended arm with your free hand, and push down slowly on your wrist until it is perpendicular to your arm, pointing straight down to the floor. Hold for five to 10 seconds, and then rest. Stretch your wrist the other way by bending it up so your fingers are pointing at the ceiling. Hold for five to 10 seconds, and then rest. Strengthening the muscles and tendons of your forearm can help prevent tennis elbow from coming back. Sit in a chair with a dumbbell in your hand. Rest your forearm on your knee so your wrist is hanging over the edge. Bend your wrist down slowly so your knuckles are pointing down at the ground, and then up so your knuckles are pointing at the ceiling. Do 10 to 12 repetitions of this action, and then rest. Do flexion exercises by turning your entire forearm so your knuckles are pointing to the right, then all the way to the left. Do 10 to 12 repetitions, and then rest. The finger extension is a simple exercise you can do anywhere, even while sitting at your desk at work. Press the tips of all the fingers on your hand together and put a rubber band around them. Slowly open your fingers as much as you can, stretching out the rubber band. Hold your fingers open for five to 10 seconds, and then close them again and relax for 10 to 15 seconds. Repeat this process five to 10 times. The ball squeeze exercise helps stretch and strengthen the muscles on the bottom of your forearm. Find a tennis ball or similar-sized ball you can squeeze. Hold the ball in your hand so it is resting in the palm of your hand. Wrap your fingers around the ball as far as you can. Slowly squeeze the ball as hard as you can. At the point where you can't squeeze any more, hold for five to 10 seconds. Relax your hand without dropping the ball. Repeat five to 10 times.